A challenge cup, 10 days of accommodation in Cimochowizna (Poland) including journey, and a sum of money in cash. The amount of money is dynamic. SZPILMAN is raising money parallel to the competition. The prize winner receives the money that is raised until September 30, 2013. 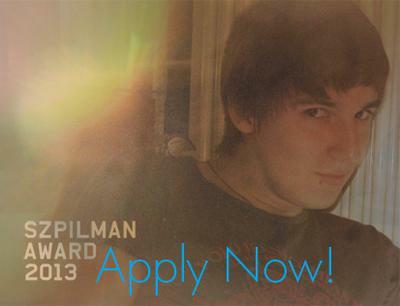 For all informations and the application form click www.award.szpilman.de and: Apply Now! Since 10 years Szpilman Award is the one and only award for ephemeral works in the world. A challenge cup, 10 days of accommodation in Cimochowizna (Poland), and a sum of money in cash. The amount of money is dynamic. Szpilman is raising money parallel to the competition. The prize winner receives the money that is raised until September 30, 2013. The current score may be checked via www.award.szpilman.de/jackpot . Everyone can apply for the Szpilman Award. Both individuals and groups of persons are free to apply. To apply, send in a significant documentation. To that, fill in the application form (PDF) with name, e-mail, telephone, address, title of the work, and date of construction. Applications by e-mail are NOT accepted. Documentations will NOT be returned. Closing date is September 30, 2013 (postmark). From November 7 till November 10, 2013 all applications will be looked through and jugded by the jury. They will select the best (shortlist) and one winner. The winner will be informed on November 10, both the best and all participants in the following week. The prize winner will be presented the challenge cup and the Jackpot Stipendium end of November 2013. The Szpilman Award is initiated, organised and financed by Szpilman, a group of artists, based in Berlin, Germany.